ATM Skimming is a modus operandi where criminals use an “ATM skimmer” - a malicious device attached to an ATM - to steal your money. 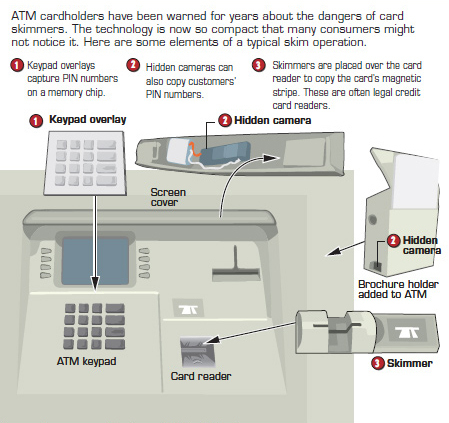 When you use a compromised ATM machine, the skimmer will copy the information in your card's magnetic strip. A hidden camera or a fake keypad will then capture your PIN as you enter it. 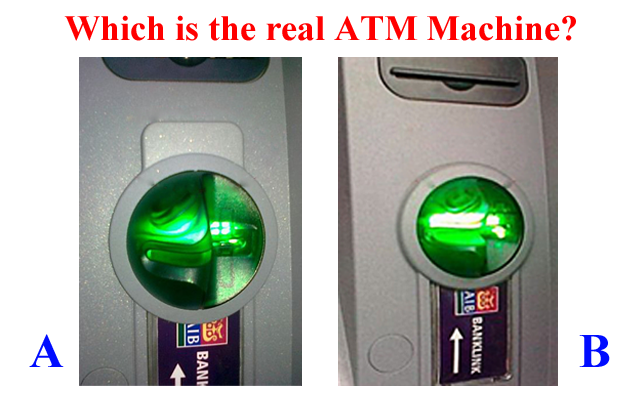 If you use ATMs often, then you should be aware of these high tech method criminals use to steal your money easily. It’s used to be easy to spot ATM skimmers. But with improving technology, including 3D printing, skimming devices are getting harder to detect. The best you can do is to protect your PIN so ATM skimmers won’t be able to capture it. The second part of the device is a small camera. A pinhole camera is placed at the top of the ATM’s screen, just above the number pad, or to the side of the pad. The camera is facing the keypad and it captures you entering your PIN. The ATM appears to be functioning normally, but the attackers just copied your card’s magnetic strip and your PIN. The attackers can use this data to clone your ATM card and use it in ATM machines, entering your PIN and withdrawing money from your bank accounts. 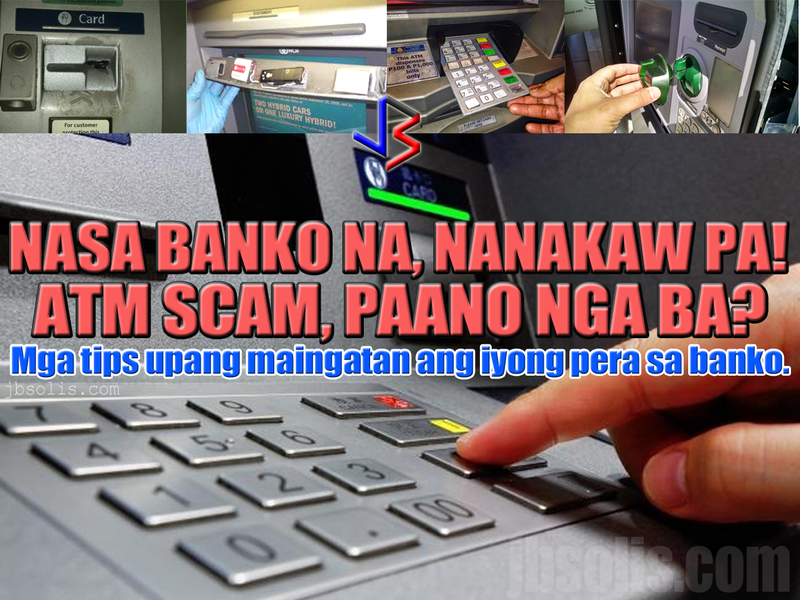 A compromised ATM Machine found in BPI Bank, Philippines. ATM skimmers generally store the data they capture on the device itself. The criminals have to come back and retrieve the skimmer to get the data it’s captured. 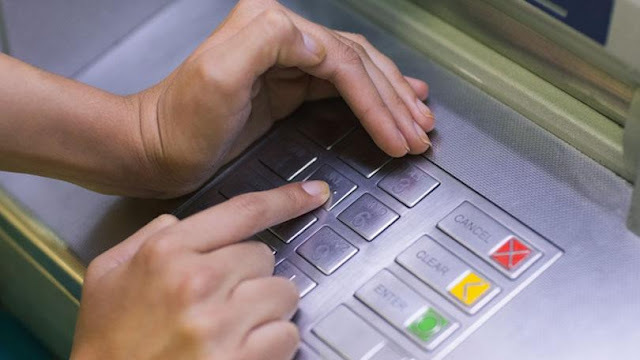 However, more ATM skimmers are now transmitting this data over wireless devices like Bluetooth or even cellular data connections. 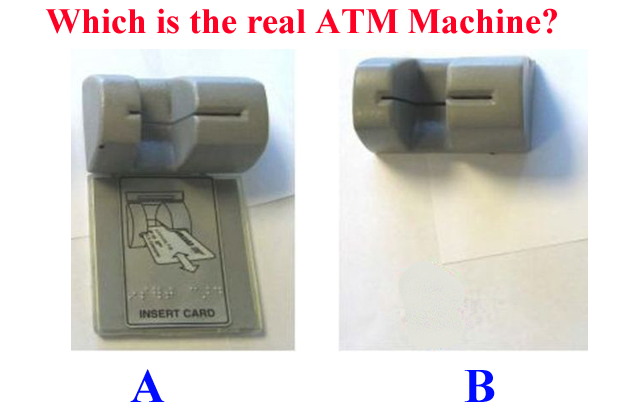 Check around the ATM Machine, if there are any devices like modems or routers hidden beside or behind the machine. Take a quick look at the ATM machine. Does anything look a bit out-of-place? Perhaps the bottom panel is a different color or looks new compared to the rest of the machine because it’s a fake piece of plastic placed over the real bottom panel and the keypad. Perhaps there’s an odd-looking object that contains a camera. Are there visible traces of glue, tape or other sticking materials around edges? A compromised ATM Machine with a card skimmer and a concealed mobile phone overhead as a camera. Examine the Keypad: Does the keypad look a bit too thick, or different from how it usually looks if you’ve used the machine before? Does it look too clean or too new compared to the machine itself? Normal wear and tear usually makes the keypad dirty and the numbers faded out. A good looking and spotless keypad may be an overlay over the real keypad. Avoid using machines in places that are dark, rural, and with very few to no people around. ATMs within the bank premises are generally more safe than those found elsewhere, but this is not always the case. ATMs in malls are also usually safe, unless the location is in a corridor far from view of the people. 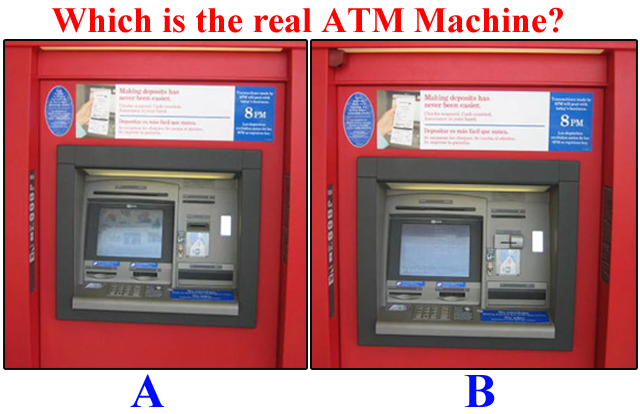 If you can, check and compare the ATM you are using with the one beside it, to see any difference. If you find some unusual differences, be safe and find another machine. Shield Your PIN With Your Hand, bag or wallet. Learn how to enter the PIN without looking at the pad. 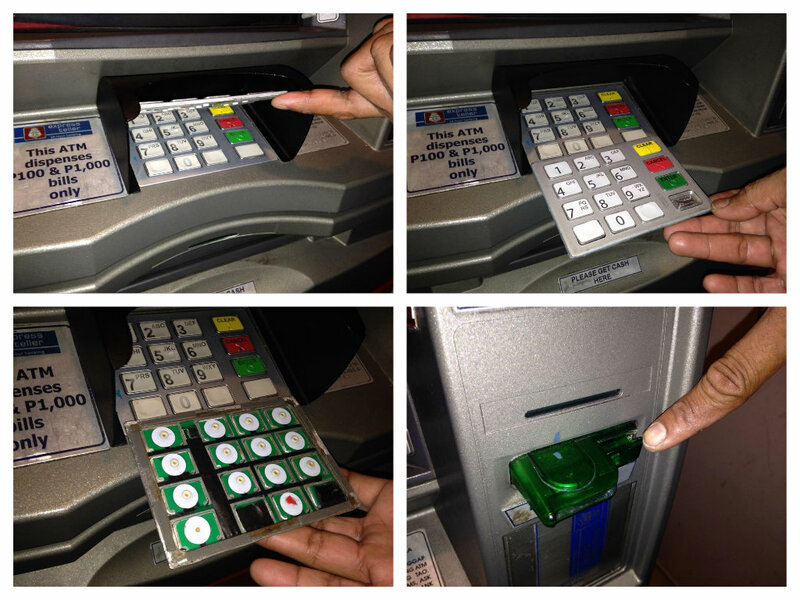 This might not protect you against the most sophisticated skimmers that use keypad overlays, but you’re much more likely to run into an ATM skimmer that uses a camera — they’re much cheaper to purchase. This is the easiest tip you can use to protect yourself. Covering the keypad by your hand is the simplest but most effective way of protecting your ATM information and your money. If your bank has it, subscribe to SMS notifications, whereby you will receive a text message each time a withdrawal or deposit is made on your account. If you suspect that an ATM machine is compromised, report it to the bank or nearest police station. 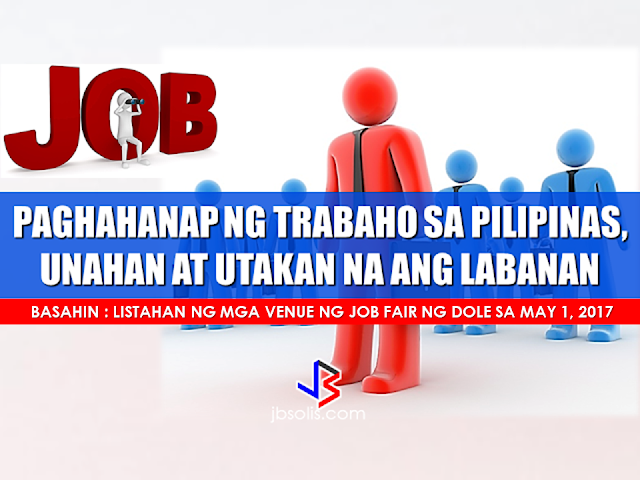 Skimming usually happens around salary and bonus dates, holidays, and days when people usually spend money (school enrollment, bills payment). ATMs in remote areas or areas with very few people are often chosen by criminals to install their skimming devices. ATMs in tourist spots are also more common since people using ATMs here are not locals. Now that you have an idea about skimming, test yourself with these images. Which of these are compromised and which ones are real and safe to use? 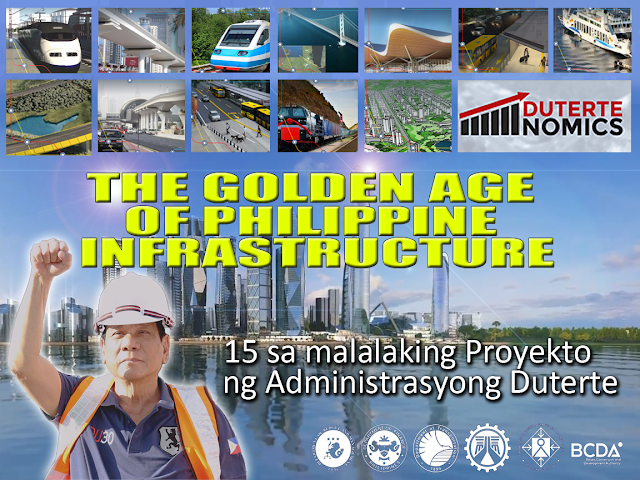 Scroll down to get the correct answers. 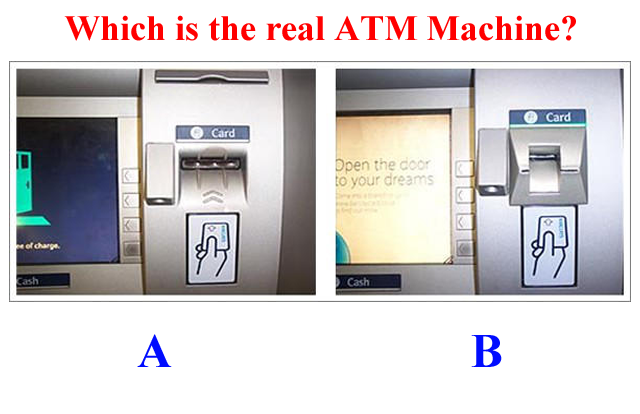 The real ATM Machines above are options A, B, B and A.